We can support you to learn to grow your own fruit and veg. We have a community garden at Milton, allotments at Springburn and Hamiltonhill and growing spaces such as raised beds in Milton and Royston. More information is available in our Food Hub Section. You will learn to sow seeds, plant out, tend, feed and sustain your plants so you end up with a great crop. We’ll help you learn to create your own raised beds or window boxes, using recycled materials. If you would like to learn how to grow your own, fill in your details or phone 0141 558 2500 and we’ll hook you up with a growing opportunity. We have lots of gardening sessions for children and young people in Milton and Royston. We work with primary and secondary schools, and host sessions in our gardens and growing spaces. In Milton garden it’s Monday’s from 4.00pm to 5.30pm with 7-10 year olds learn about planting and having fun growing their own vegetables. waste and making their own compost. We organise bug hunting and can help create child friendly growing spaces and wildlife habitats, making bug hotels and the like!! 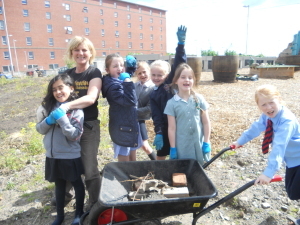 If you would like to organise sessions for young people or would like your children to learn about gardening, fill in your details or phone 0141 558 2500 and we’ll hook you up with a growing opportunity.